Water, an element of constantly changing states, is an ideal lens to to help us see, understand, and respond to the world. Using water-related idioms and quotes, the prints and objects in this exhibition playfully present lessons learned and experience gained. Through printmaking and photography, these common water words come together to create a collection of water-based images. Narrative and illustrative in nature, these works function as meditative devices, reminding us that we only move forward by acknowledging the past and present, both physically and mentally, with patience and understanding. Sarika Sugla is a visual artist currently living in New Jersey. Sarika received her MFA in Printmaking in 2014 from the University of Iowa and a BFA from the Maryland Institute College of Art in Baltimore, MD in 2011. She has worked as an Assistant Printer at the Brodsky Center at Rutgers University and has previously worked as an Assistant Curator at the University of Iowa Museum of Art from 2014–2016. 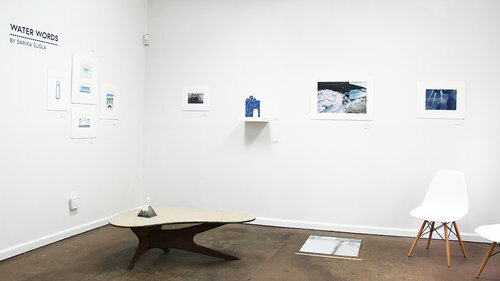 Sarika has exhibited widely within the United States and most recently completed a residency at La Ceiba Gráfica in La Orduña, Mexico.